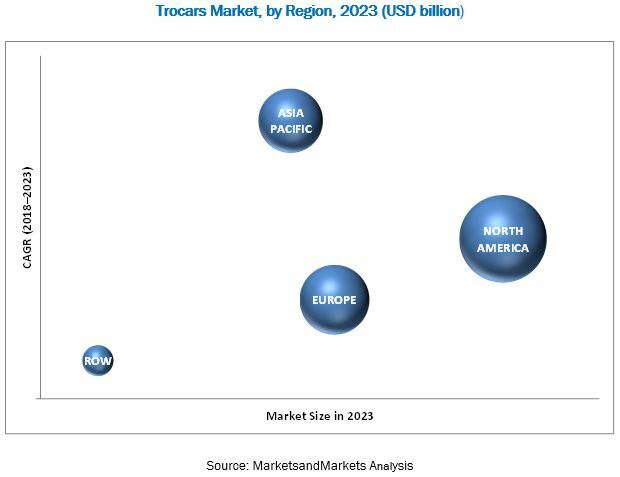 [108 Pages Report] The trocars market is expected to reach USD 762.3 million by 2023 from USD 502.8 million in 2017, at a CAGR of 7.2% during the forecast period. The base year for this study is 2017 and the forecast period is 2018–2023. The demand for minimally invasive surgeries (MIS) has grown over the years owing to their advantages over conventional surgical techniques. Apart from time and cost reductions, minimally invasive surgeries are also associated with increased safety, decreased scarring, faster recovery, and decreased hospital stay. A news article published on March 25, 2015, in JAMA (Journal of the American Medical Association) stated that research conducted by investigators at Johns Hopkins Medicine (Johns Hopkins University (US)) showed that American hospitals could collectively save between USD 280 million and USD 340 million a year by performing MIS instead of traditional surgeries. Over the last few years, the prevalence and incidences cases of target diseases is increasing across the globe. For instance, according to GLOBOCAN, the number of colorectal cancer cases globally is expected to reach 0.85 million by 2025 from 0.66 million in 2015. The rising incidence of these diseases will correspondingly drive the number of laparoscopic procedures performed. Of these, appendectomies and hysterectomies are the most frequently performed laparoscopic procedures globally. The company opened 5 new production and administration facilities in Panang, to cater end users in Malaysia. The company will manufacture medical devices for infusion therapy, pharmaceutical solutions, and surgical instruments in these facilities. GENICON, INC entered distribution agreement with Greenpine Pharma, China to distribute its complete range of products in China. The GENICON, INC announced that it is an official supplier to the NHS supply chain. Teleflex acquired its distributor company Human Medics based in South Korea. This acquisition strengthened the company’s position in the APAC market. The company acquired its distributor company N Stenning & Co PTY. LTD, based in Australia, thereby expanding its presence in the country. The company promoted its laparoscopic portfolio at the Davos Course for gastrointestinal surgery scientific session held in Switzerland. The company commenced regional distribution training programs to guide its global distributors regarding the company’s product portfolio. 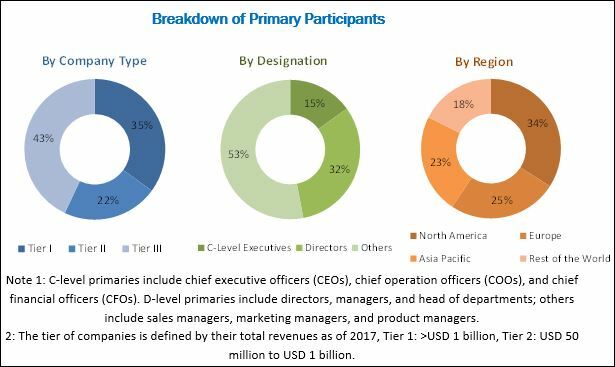 The global trocars market is expected to reach USD 763.2 million by 2023 from USD 538.5 million in 2018, at a CAGR of 7.2%. The major factors driving the growth of this market are the increasing prevalence of cancer and hernia and growing preference for minimally invasive surgery. Based on product, the market has been segmented into disposable trocars, reposable trocars, reusable trocars, and accessories. In 2018, the disposable trocars segment is expected to account for the largest share of the market. Their cost-effectiveness, user-friendliness, and safety have resulted in their greater adoption, as compared to reusable trocars. On the basis of type, the market has been segmented into bladeless trocars, optical trocars, blunt trocars, and bladed trocars. In 2018, the bladeless trocars segment is estimated to account for the largest market share during the forecast period. This is primarily attributed to the advantages such as ease-of-use of bladeless tip trocars, no trauma to the internal body organs and vessels. Moreover, the ergonomic design of these trocars offers high stability. Based on application, the market has been segmented into general surgery, gynecological surgery, pediatric surgery, urological surgery, and other surgeries. The general surgery segment is estimated to register highest growth rate during the forecast period. The highest growth rate of this segment is mainly due to the rising number of obesity, hernia, and appendicitis cases. On the basis of end user, the market is categorized into hospitals and other end users. In 2018, the hospitals segment is expected to account for the largest share of this market. The presence of robust infrastructure to carryout laparoscopic surgeries and availability of skilled professionals are the major factors driving the growth of this market segment. The market is dominated by North America, followed by Europe, Asia Pacific. North America will continue to dominate the market during the forecast period. The increasing incidence of various diseases such as cancer, hernia, and obesity in this region and availability of reimbursement in this region are the major factors supporting the growth of the market in North America. The major players in the trocars market include Medtronic (Ireland), Ethicon (US), B. Braun (Germany), Applied Medical (US), Cooper Companies (US), Teleflex (US), CONMED (US), LaproSurge (UK), Purple Surgical (UK), and GENICON (US). 12.2 Johnson & Johnson Services, Inc.